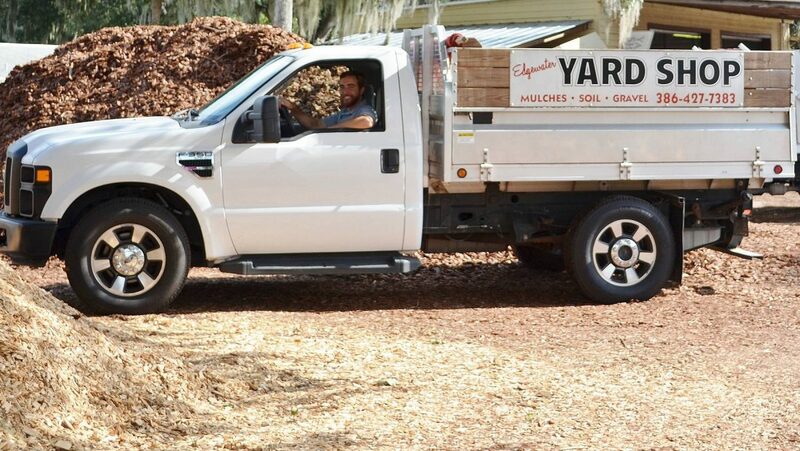 Edgewater Yard Shop provides New Smyrna Beach homeowners, contractors and commercial properties with professional grade mulches, soils, sandstone and edging materials. From planting soil, to clean fill dirt, to peat moss, paver base and top soil, we have it and so much more! We offer a full range of landscaping materials, including mulch in cypress blend, pine bark, designer red, cypress chips and pine straw varieties. We also offer washed shell, limestone, salt and pepper granite and river rock in various varieties. Proudly serving the landscaping needs of East Central Florida for over 20 years, we are the trusted yard supply shop of choice for the New Smyrna Beach area. Aside from stellar service to the New Smyrna Beach community, we also deliver to Edgewater, Oak Hill, Port Orange, Daytona Beach, Ormond Beach, Mims and the surrounding area. Owner-operated and Hometown New Readers’ Choice for landscaping supplies, Edgewater Yard Shop has always been known for reliable service. Our deliveries are always on time, our materials are top quality, professional grade and always fresh due to our high product turnover. Stop by our convenient Edgewater location to browse our full array of inventory or give us a call at 386-427-7383 for more information. Our friendly, knowledgeable staff is standing by!